The Buffalo Hunt is a fully guided hunt on "7,000-plus acres - 3 1/2 square miles of untamed plains"of the ranch where the buffalo roam free. This is the largest game animal in North America. The largest bull that has been taken at the ranch weighed over 2100 lbs. We have many bulls that are in that range of weight. We also have younger trophy bulls that weigh in at 1200-1500 lbs., and older burger cows that are 2 to 4 years of age weighing 900 to 1100 lbs. The younger cows have good tender cuts of meat that would make good steaks. We also have bison calves that weigh 450 to 600 pounds. These calves also produce very tender cuts of meat. 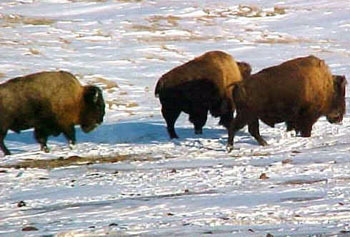 Please note that Trophy Buffalo hunts are prime hunts in the winter. The buffalo hides are thicker and more plush at this time of year. They make your trophy hunt more memorable. 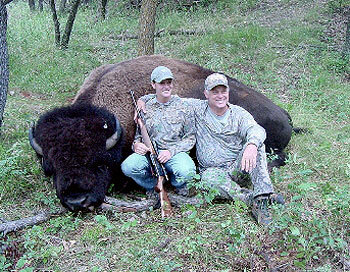 You can hunt your buffalo with a bow, black powder rifle or large caliber rifle. We will guide you within shooting range of the animal of your choice. After you have shot your bison, we will transport your animal to a processing facility nearby that specializes in bison. You keep all your buffalo meat! All inclusive includes two nights and morning and evening meals buffalo hunting, includes guided trophy bison hunt by the pound, and transportation of your bison to a nearby slaughter facility that specializes in bison. You keep all your meat! Approx. weight is 1,200 to 2,000 lbs. $500 down deposit is required to hold your selected hunting date. Balance due on the day of your hunt in cash. 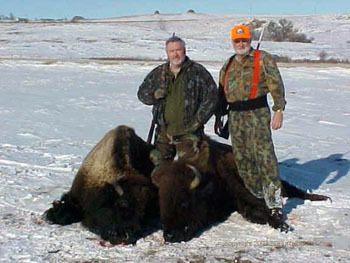 Buffalo hunting, includes guided trophy bison hunt, and transportation of your bison to a nearby slaughter facility that specializes in buffalo meat. Approx. weight is 1,800 to 2,000 lbs. 50% deposit is required to hold your selected hunting date. Includes guided bison hunt, complimentary and transportation of your bison to a nearby slaughter facility that specializes in bison. The Bison lodge consists of a very nice large 4 bedroom ranch home with a large living area , kitchen and dining area, and can sleep 8 very comfortably. You may choose to stay in this facility. This is in the more remote area of South Dakota the ranch is on for the Bison herd. Don't forget we will pick you up from the airport if you contact us for those arrangements. Air port is near by. You may click on this link to contact airport. We at Bison hunts know that not all people buffalo hunt. 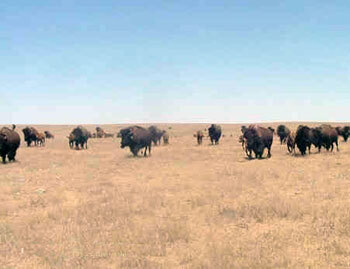 So we would still like to give those an opportunity to enjoy the fresh and wonderful flavor of buffalo meat. We the ability to package and ship an order around the country. What makes our buffalo meat different? The bison here are grass fed NO hormones or Growth promotants used. BSE FREE NO Animal by products used in their feed. Our bison meat is processed and inspected in our inspected processing plant. We only wish to sell you the most natural bison meat possible. Bison or buffalo are the only animal that does not get cancer. Is NON ALERGENIC to humans, 70% to 90% less fat. An average of 50% less cholesterol and 30% higher protein with less calories. Bison are very high in the essential fatty acids and have an excellent ratio of Omega-3 to Omega-6 acids and contain more CLA (conjugated linoleic acid. Bison meat can reduce LDL cholesterol by as much as 40- 45 % over a 6 month period by eating only 5 oz. 4 to 5 times a week . That is why many cardiologists recommend to patients with high cholesterol to eat bison meat as a source of protein in their diet. Buffalo meat is a great choice over all the other red meats for a great source of protein.